Mark S. Decker 'Corky' is an IGFA Certified Captain, a commercial bluefin tuna harpooner and a renowned marlin guide. Corky has fished around the world putting his clients into numerous record class fish year after year. He is a freelance writer and author, who contributes regularly to fishing and hunting magazines in the USA and internationally. His new book 'Harpoon' is now available in paperback and kindle. You can read samples of his books and find out more about him on his web site www.corkydecker.com . For any fishing and hunting questions, he can be reached at corkydecker@corkydecker.com He now makes his home in Freeport, Florida with his New Zealand-born wife Maggie. If you enjoy reading non-fiction books where the author’s personality and charisma are as much a part of the narrative as the subject, Harpoon: The Passion of Hunting the Magnificent Bluefin Tuna by Captain Corky Decker is for you. If you happen to be a fan of sport fishing or have an interest in the fishing industry or the history of harpooning, so much the better. I’m none of those, but I didn’t want to put this book down. Captain Decker, a commercial harpooner, writes in the way I suspect that he speaks. He’s to-the-point, down-to-earth, enthusiastic, friendly, and business-like, all at the same time. I knew little about the bluefin tuna when I started, but I’ve gained a new appreciation for both the fish and the harpooners who hunt it. Photographs add a wow factor for readers not familiar with the size of this amazing creature. 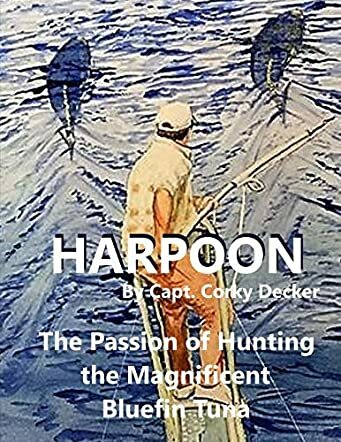 In Harpoon, Captain Decker provides an informative and engaging treatment of the topic, starting with his first thrilling view of a bluefin tuna at the age of five and ending decades later as a new crop of young people experience the same thrill. He covers the history of harpooning, the business aspects of the fishery, and the future of the industry, with a splash of interesting memories and adventures along the way. I was happy to learn that harpooning is far more humane in its killing of the fish than other methods. I can see now why the bluefin is the most prized and expensive fish in the sea. An enjoyable and informative read.